CBS’ city showdown segments ping-pong back and forth between Rocca (in City #1) and fellow correspondent Michelle Miller (in City #2) as they show off their respective city’s best, oddest and most historic places. (Spots on the Rhode Island crew’s list included the Big Blue Bug, the Providence Journal — the nation’s oldest continuously operating daily newspaper — and the largest bell ever cast by Paul Revere.) 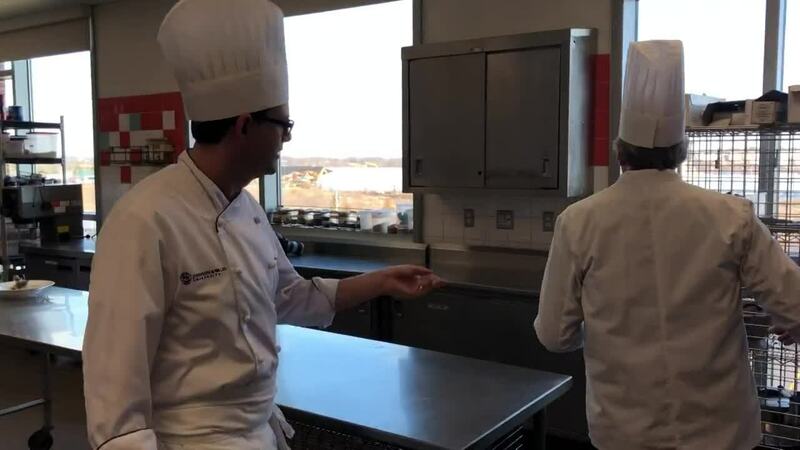 JWU was chosen as a top producer of culinary talent. The crew visited three classes: Chef Mark Soliday’s Specialty Cakes class was focusing on perfecting cake roses in a rainbow of colors; Chef Matthew Britt’s Cooking in the Global Marketplace class was readying a Middle Eastern lunch for a visiting tour group; and Chef Juergen Knorr’s Craft of Garde Manger was whipping up a wide range of buffet dishes. 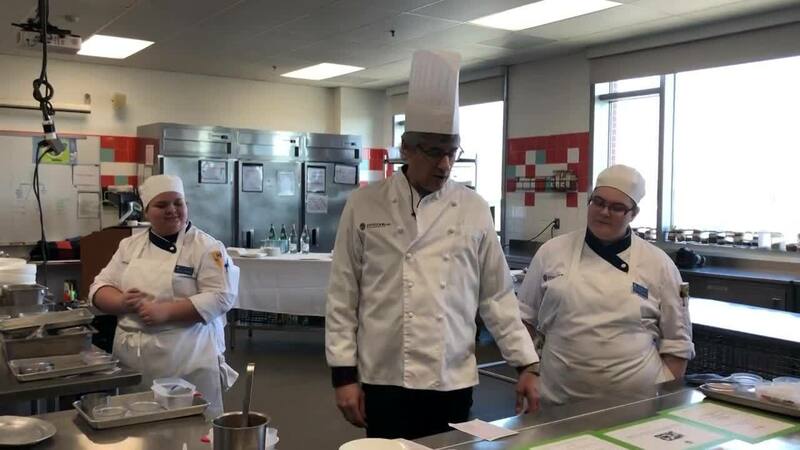 Enjoy these behind-the-scenes images from the shoot, including Rocca posing for a group selfie with students and working on his expediting gravitas in Chef Britt’s class. The segment is expected to air Thursday morning — check Mo Rocca’s Twitter feed for updates. VIDEO: ROCCA GETS A LESSON IN EXPEDITING AND GRABS SOME LUNCH ON THE GO. PHOTOS: BEHIND THE SCENES AT JWU.